The last two days have been busy with various medical appointments for Arthur, my uncle, but I took some time to get the last of my "student goodbyes" organized. 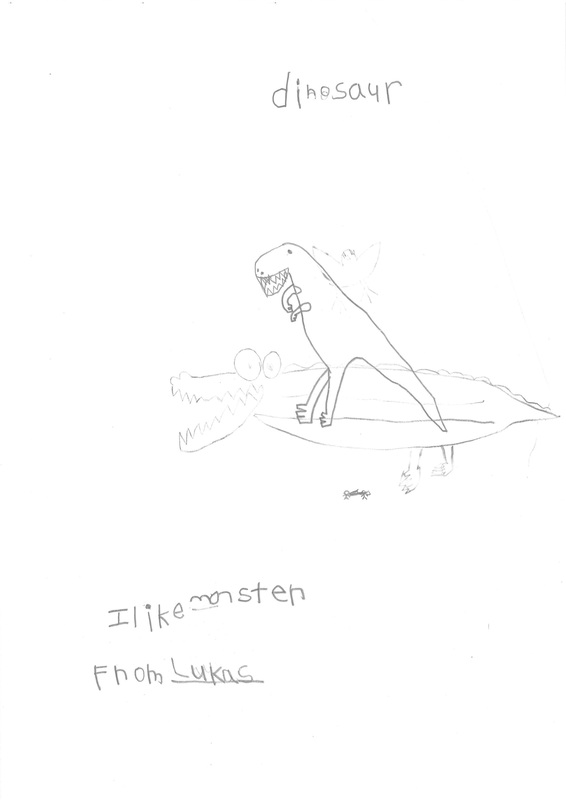 These are just scans of papers they made for me – unlike with the "yearbook" I posted in the last set, these were done at my request, which I felt more-or-less okay about doing with the younger students. 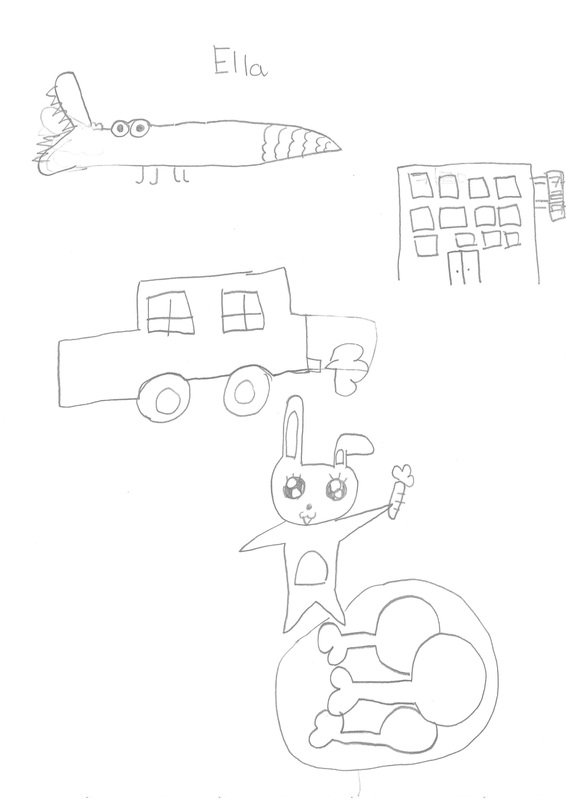 The youngest just made pictures. 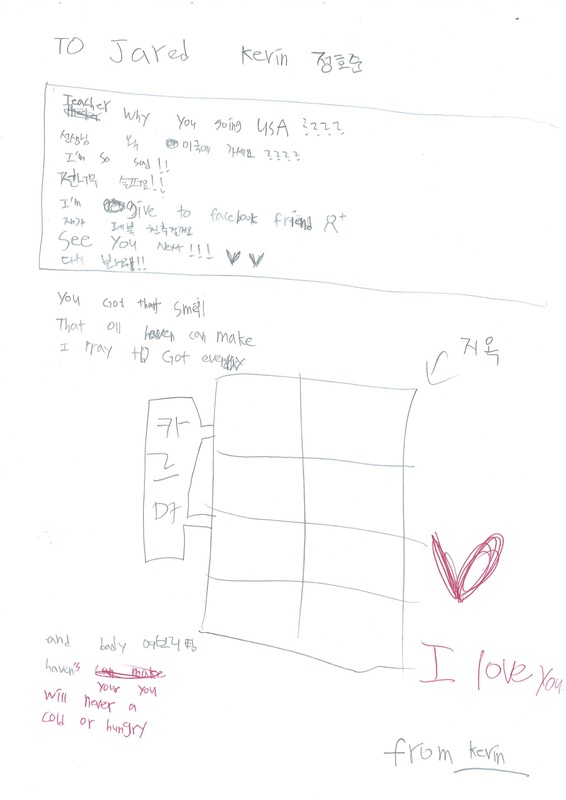 The next older cohorts made messages, often in Korean, while the oldest would sometimes write in English. 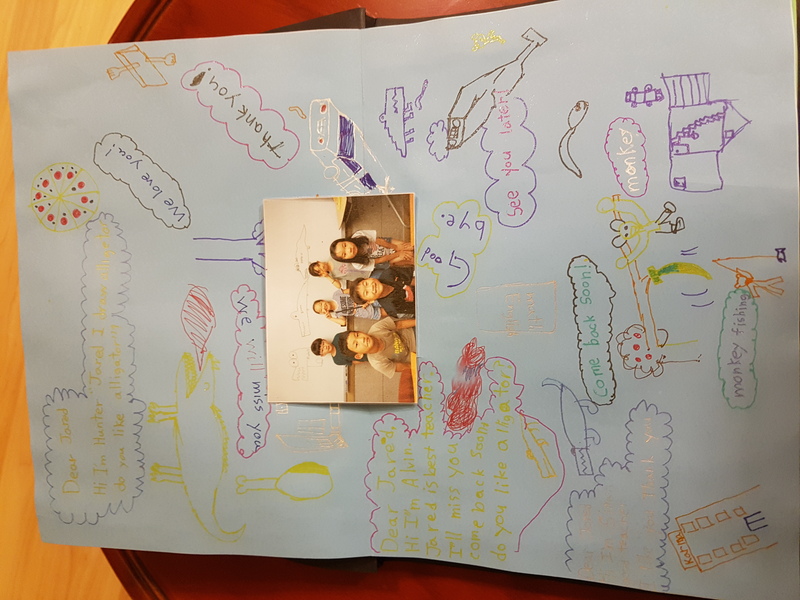 Here are some more goodbye messages I have received from students. It being currently 4 AM in Oregon, and feeling wide awake from jetlag, I decided to make this post. 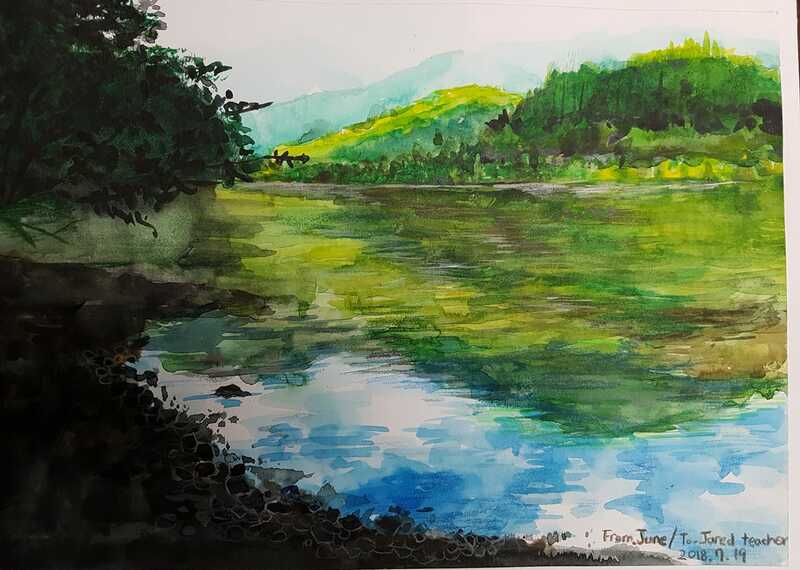 Firstly, my student Jun Hui, 7th grade, gave me this painting. She painted it from a photo on my blog, here. 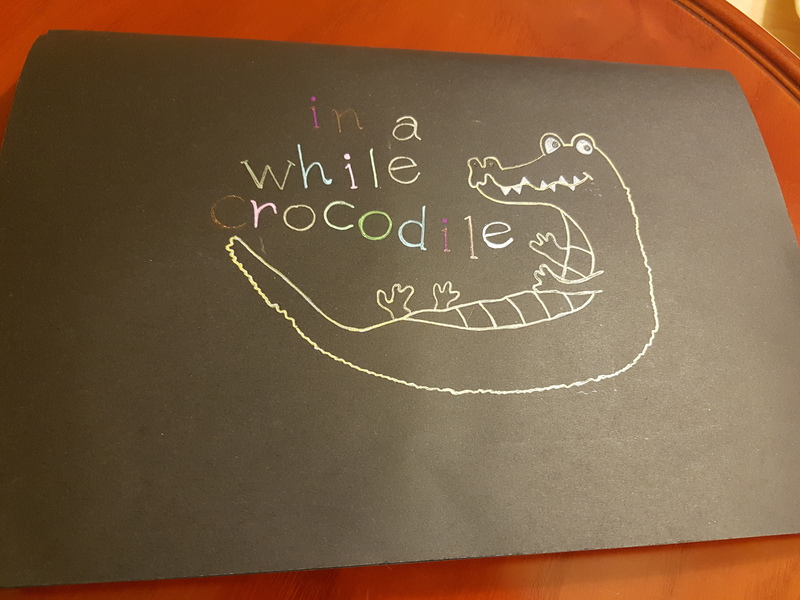 My coworker Grace created this "yearbook" with her students. It's quite amazing and beautiful. Grace managed to do this without me being aware that it was being worked on – she was good at getting all the kids to keep the secret of its creation. 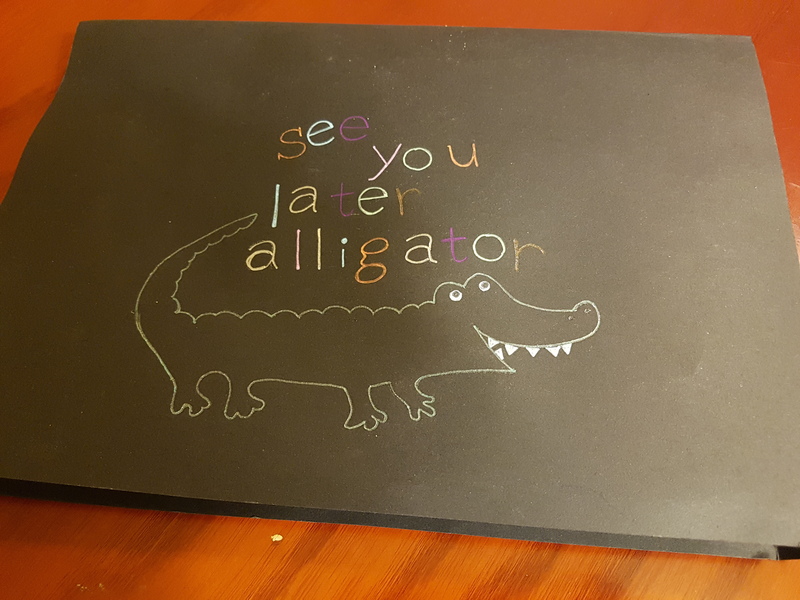 On the front cover is "See you later alligator" and on the back cover is "In a while crocodile." 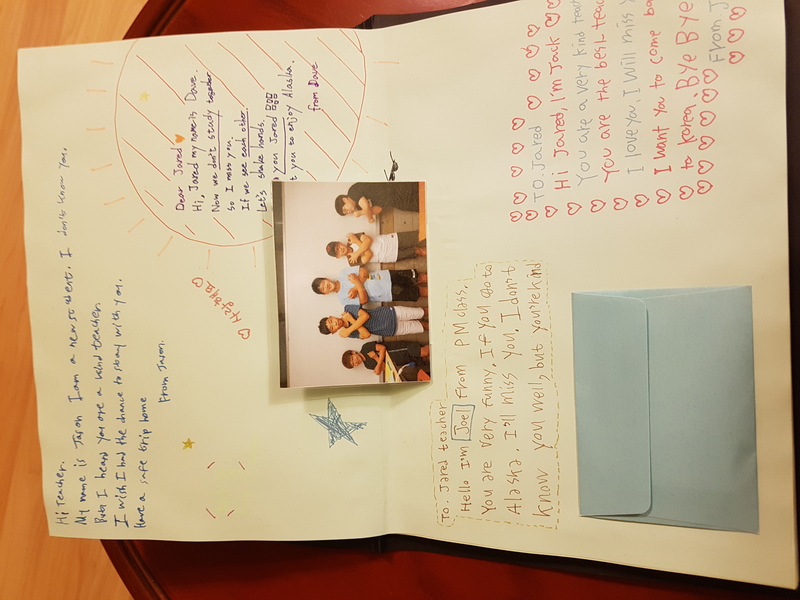 There were many envelopes and other goodbyes handed to me, too. I've put these into the yearbook. My student Shelley created some paper flowers. 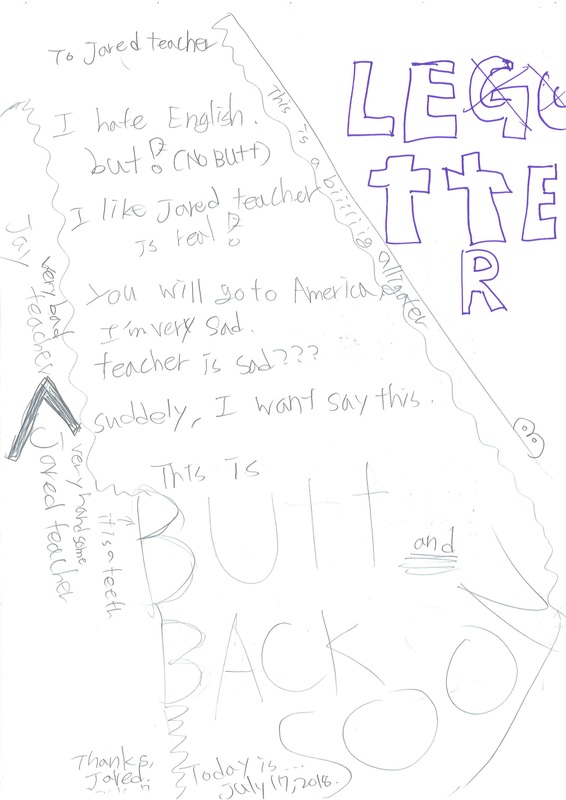 Inside, was a secret note that explained how all the students were making letters for me. 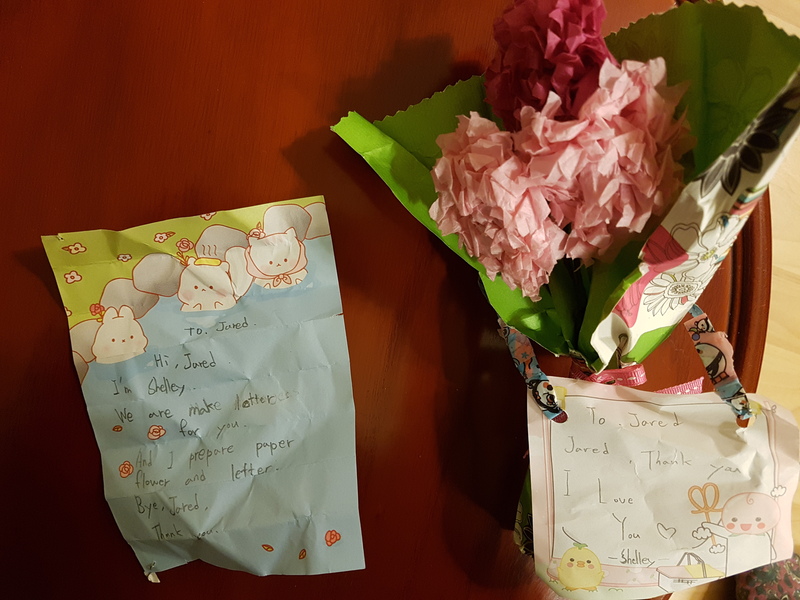 She had to keep the secret, see, but she had to tell, so she made a note and put it in the flowers which she would give to me. 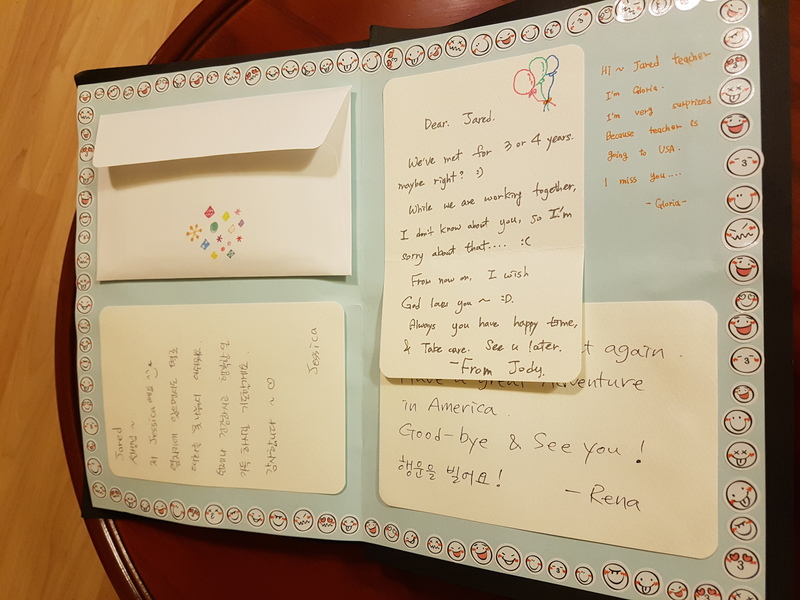 I have some scans of some other goodbyes papers I'll post later, in a part 3. 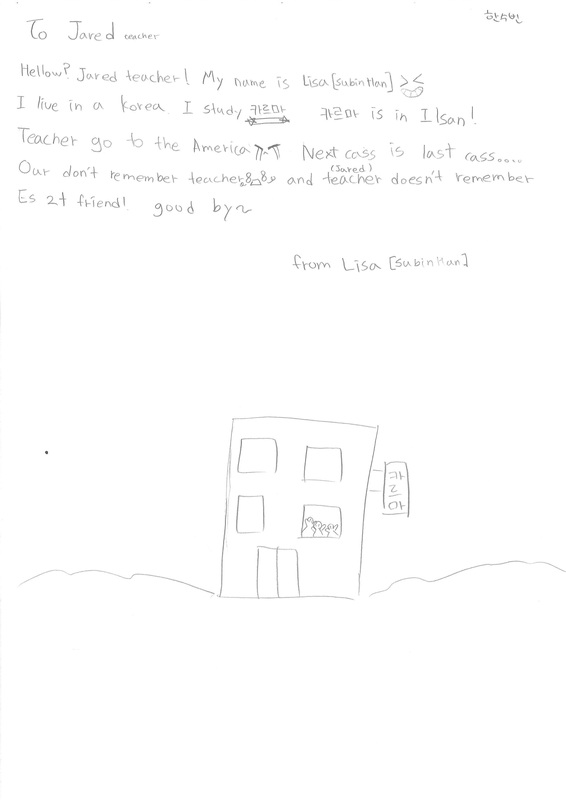 I didn't make it an official homework assignment, but I told my students I would welcome thoughtful goodbye messages. 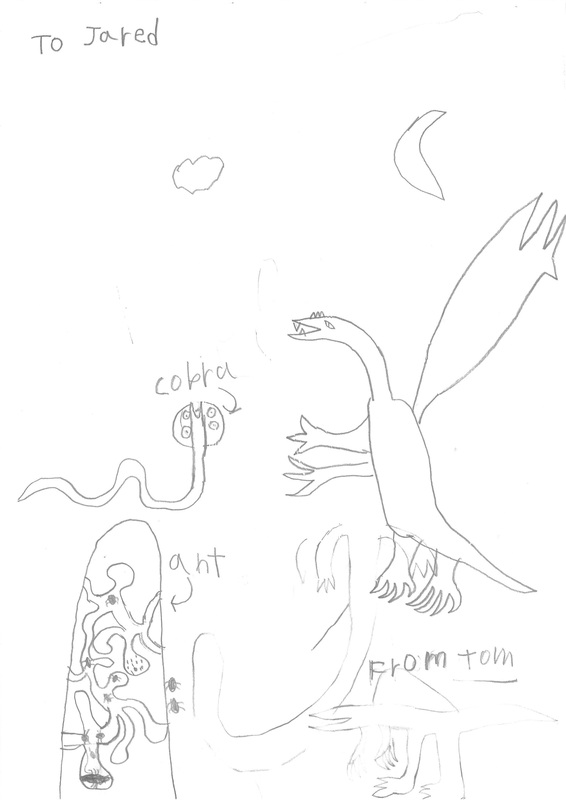 Mostly the elementary kids wrote on paper, while the middle schoolers wrote me emails. I will scan the handwritten messages tomorrow and maybe post them once I get to Oregon. For today, here are some of my older students' typed messages. I place them here unedited in any way. 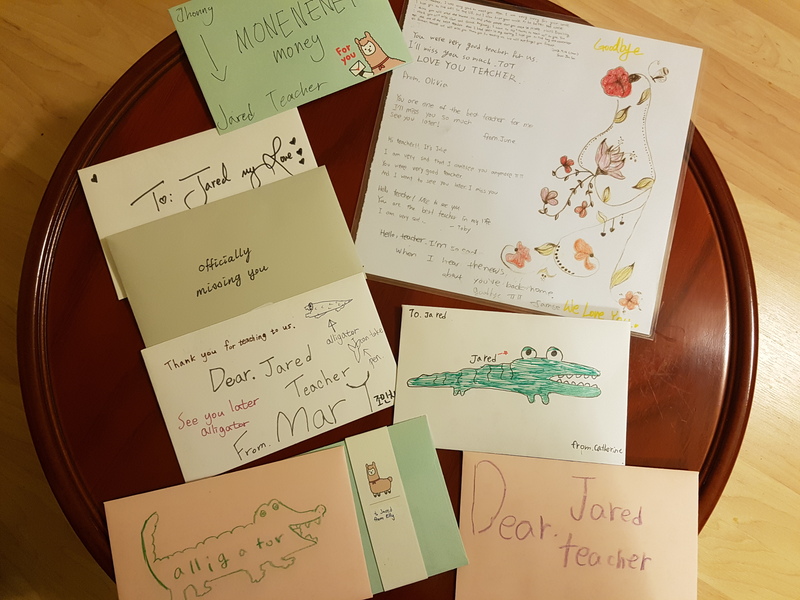 I can only say that I am deeply touched by all these messages, and I will miss these students greatly. 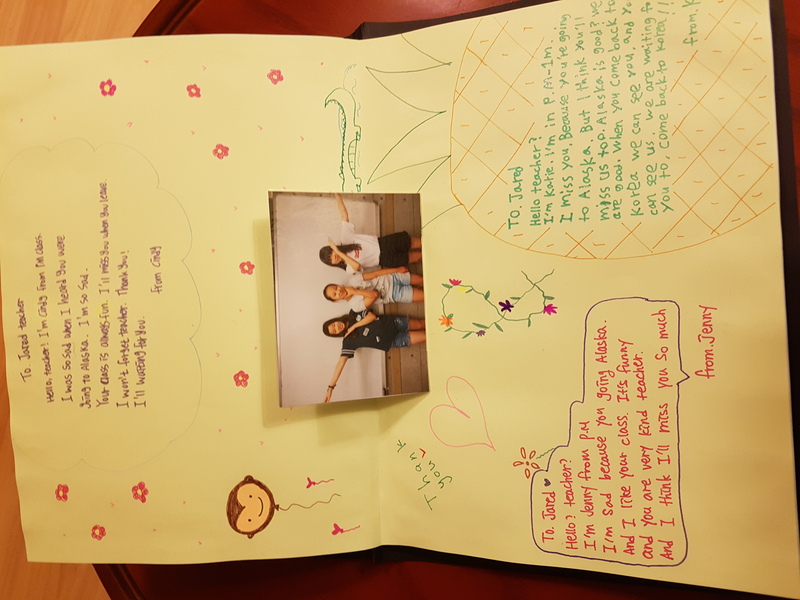 Hi, Jieun – Joy – Park Daegi is writing this letter. I sincerely cannot believe where you are going tomorrow. I’m very sorry to say good bye to you. But I also know that you have to be, you must be, should be happy despite of your living area. And you will be, too. You are the one of the best teachers I have ever met. Jared, You taught me so many valuable things including English skills. 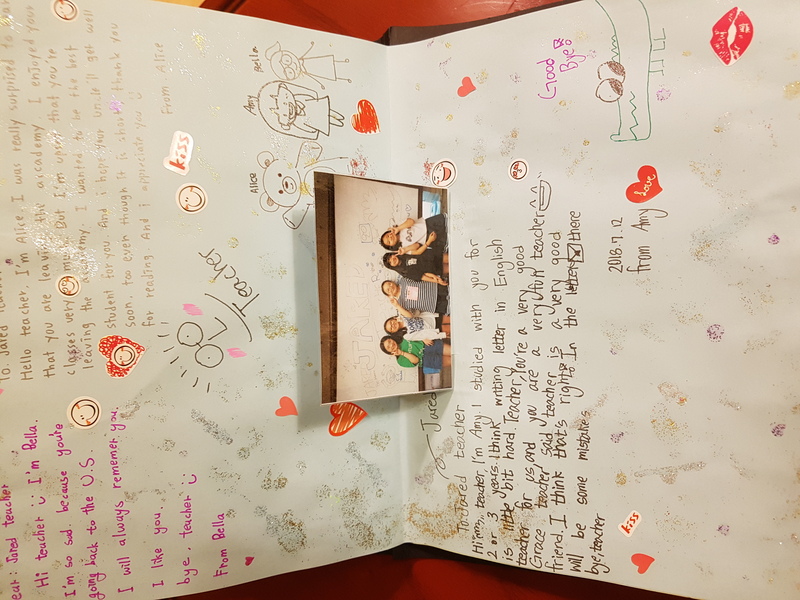 Speaking, Writing, Listening, Comprehensive Class, and all the kinds of games, – such as Mafias, Beans, Board, Taro – I will never forget what you gave me. In the moment of writing these sentences, I feel like I’m gonna cry a little, thinking about the past (with you). Maybe, …I remember when I first met you in 2012. Even though I did not know much about you, I felt comfortable and I liked you a lot. (Still I do.) You are like my father, and sometimes you are like my best friend. I really like the way you are and respect you as a great teacher. Whenever I have a talk with you, it is fresh, new, and fun. You are highly helpful person to me. You respect me as a human. So I’m gonna respect your every decision. This flight is by your own decision, and I respect it without saying a complaint. You are estimable. Except me, all of your friends would think like that. The person who made my dream is you. Jared affected me very much. From now on, I am going to learn Spanish and Latin, sometimes Japanese to realize my hopes. I would love to write stories, I love talking with ‘my’ people. When I am more than 20 years old, I want to be a writer who writes essays, novels, and plays. I want to be a linguist as I told you. I want to be counselor for young wandering children. I want to be a linguistic professor. One thing is indisputable. Even if I do not realize those dreams, I am sure I must be happy anyway. There are still many words to convey, but I cut it out because there are also many letters to write later. Just remember you will do well. The road you take would be the best way for you. Take care. Will miss you a lot. Will often write a letter when I feel relaxed. God Always Blesses You, haha. Jared. I'm Su Min. Wow, you are leaving ? I can't beileve it. I think it was so short time for us to share our episodes. 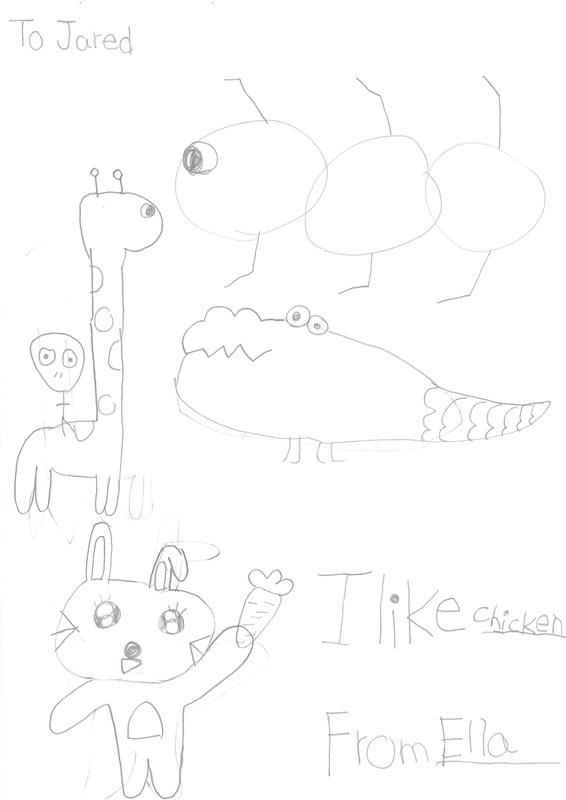 I can have so interesting informations from your class. Thank you. I always expected to get fresh stories in Toefl class. It was really fun. I wish you had feel how concentrated I am. I can remember El Nino and la nina. Of course I can't understand yet. I only know that it is the climate changes that give negetive effects when temperature is stop by 10 years … bla bla Whatever, good information. I am exactly surprised when you can explain everything about any topics and I haven't heard you are yelling. I really respect about that points.^!^ You are my role model. I love teps listening because I like your style. Thank you for making interest in teps listening even if it was hard. In addition, I really want to thank you that you are always confident about me. Believe it or not, I felt in my heart. I wish this is true! I built confidence because of you. Thank you. I'm afraid that I can't speak with you, so I can't get awesome stories. I felt I gradually hear what you are speaking and now I can understand excatly 98.3%, because 1.7% is my vocabulary skill. See~~ I get confident in this section. My strength is listening!! Thank you for being my best teacher. Oh! you said I have to write Who I am and Why You should remember me. Okay, Don't forget me Jared. I can't forget you either. And you should remember me because I'm the student who likes your class most. 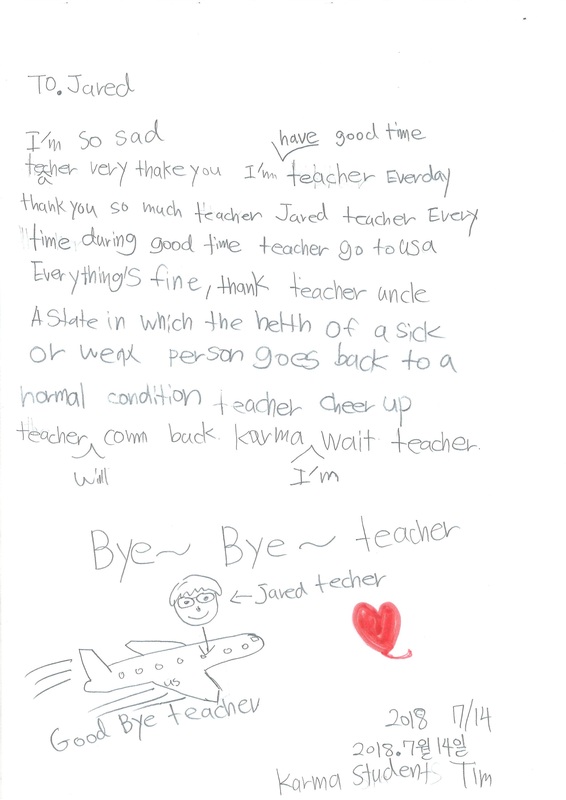 I have seen many foreign teachers for 10 years. However, you are my best. You should be proud of this. ^^ I think Every students will think like me. I will work hard and of course I will get in touch with my curious questions. I will expect incredible reply. Please be healthy. And be happy. 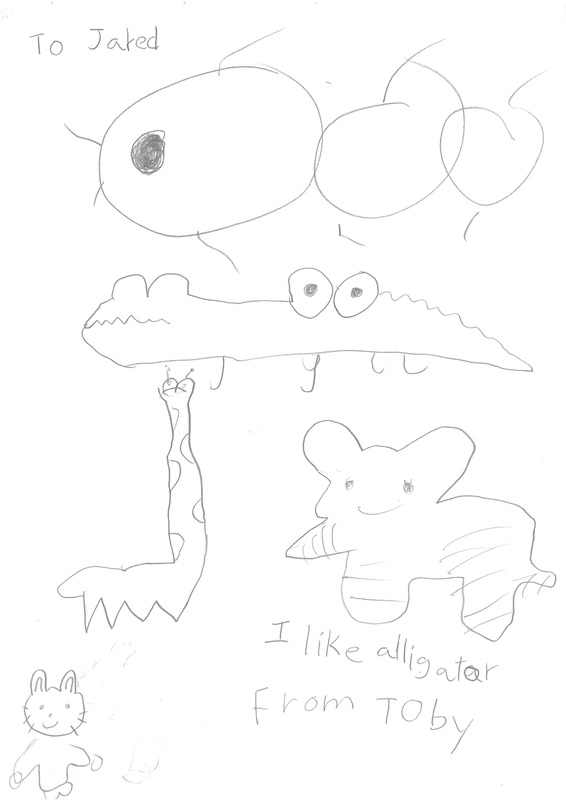 I will miss you and your greeting, Hi alligators~! Are you ready for fun English?~~ (Is that right?) 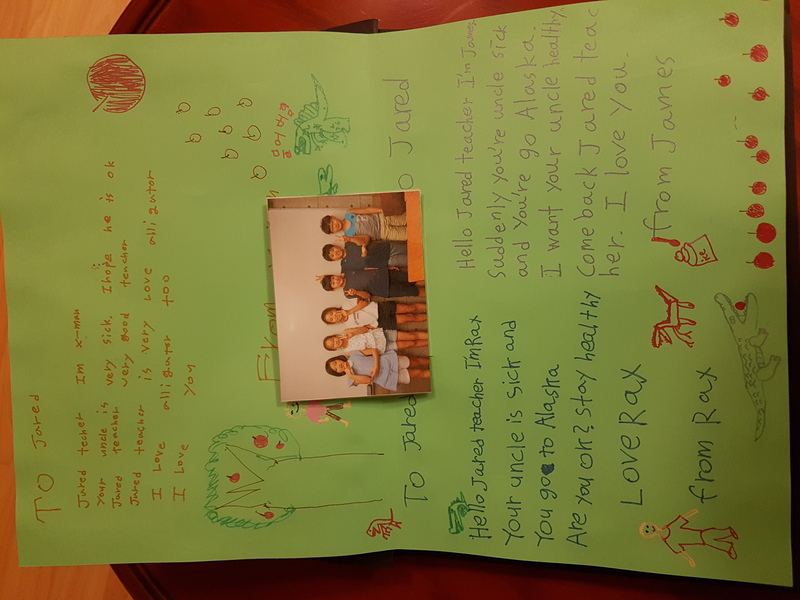 What ever, Thank you so much Jared. Thank you. Um…This kind of thing is so shy…. I am very surprised to hear the news that you leave Korea. To be honest, I am very sad that I have to say "Good bye"to you. To tell the truth,you are the first native English teacher I have ever met. And I have studied with you in Karma since last December. First, I could not speak English very well. But after I met you, I practiced speaking more. So my speaking skill became better than that time. Your explanations and own stories helped me very much. Oh I think also my listening skill became better. Now I can concentrate on what others are saying in English too. I think I could not became better without your help. And I also feel sorry for you because,I did my best but I could not write my essay well. (This means homework..haha) But you told me how to write essay correctly. From then on, I am practicing writing essay correctly.. I think I would be better more and more if I practice many times. You also helped me adapt to Karma. Your classes and games helped me to get along with my good friends. And your story and joke always made us to have fun. (Like 'Jamesfied'..) You made classes fun! I do not know other people's opinions, but I think your class is the most fun. So I always waited for your listening,speaking,writing class. You were very good teacher for us. You have many knowledge and experience, so we could learn about culture of the world, what the tornado is, why did the water dried on some river,..more than that. So I am very sorry that you are leaving. But I will keep in touch with you after you leave Korea!! Hi, Jared teacher. I'm June. You must go U.S.A. Your uncle is sick. When I was six grade, I met you. 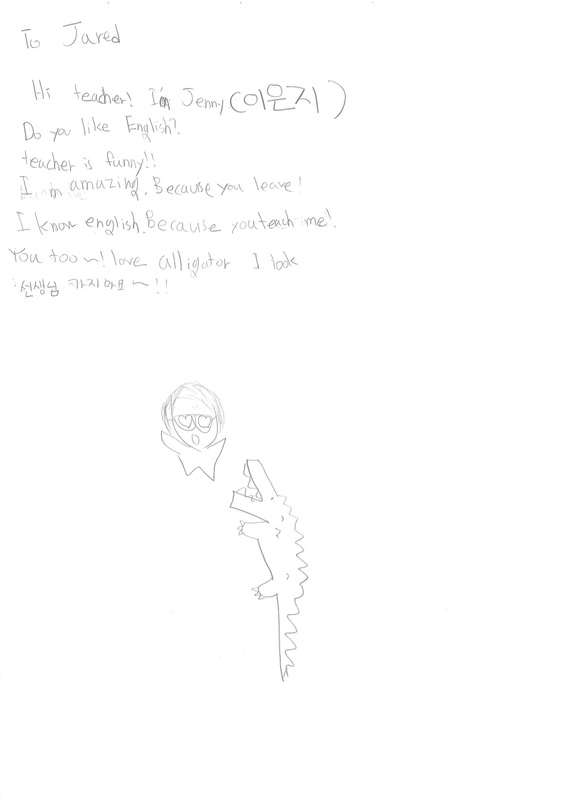 I was nervous when my foreign teacher was not familiar. But my teacher is really good, so I think I enjoyed my class. It was good that you always teach me a lot, but I feel bad because you go to America. I had a class with you for 7 months after I came to middle school. It was so fun! I don't want you to go, but I have to go because someone like your father is sick. 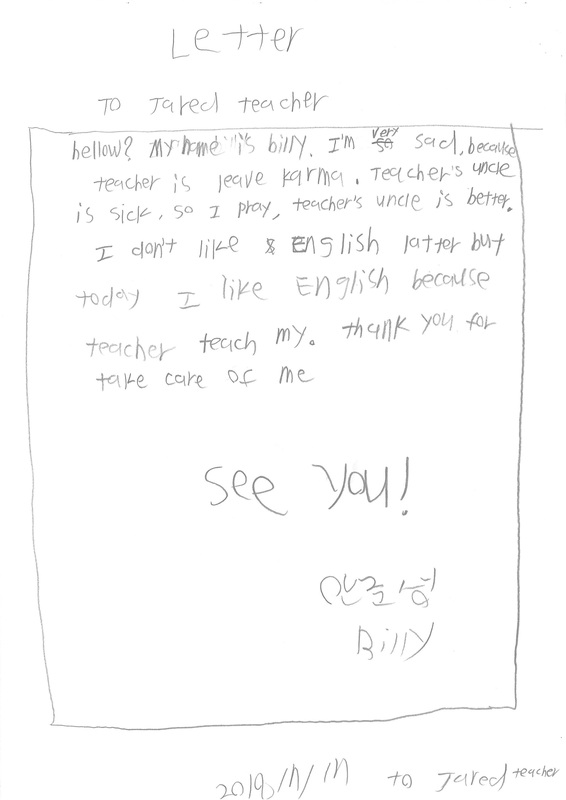 Teacher must be sad because uncle is sick. I don't know when you will come to America, but you can contact me! I still don't know who I'll be with if you go to the States. I wish I could be an interesting person like you. Teacher, if anything happens, I'll listen to your advice. I'll think you're going, but it's next to you. I will get along well in my school life, so I want you to get along. Take good care of your uncle, too. I will also pray so that the disease doesn't get worse. Of course, you should take care of your health. I will stay healthy, too. Let's meet in good health the next time we meet. Teacher! Then you should always be healthy. Then I'll write it down to here. Goodbye! See you later. Hello, Jared teacher. 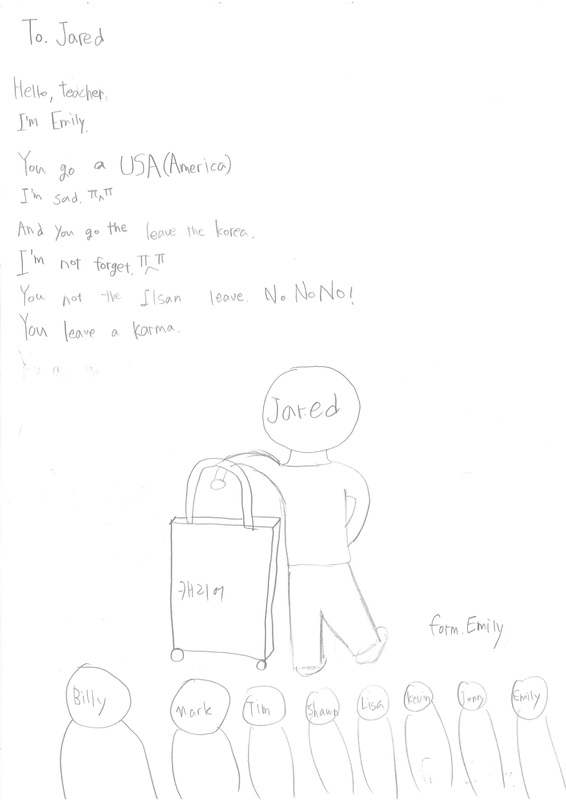 I am writing this letter because you will come back to the United States of America. I met you when I was in 5th grade. And you are always seem happy. When I listened you will come back to the United States of America? I was little bit sad. You always kind to everybody. When I was in the Newton1 class? I played many games with you. It was very fun. I want to play that many games with you again and again. But you will come back to the America because you’re uncle is sick. I do not have that experience. But I empathize your situation. You said that your uncle is like second father. That means you need him and he loves you. So maybe I think your uncle is very important in your life. So if I am in your situation, I will do like you. I will pray your uncle is not sick. If you have some times in the United States of America? I believe you will check the E-mail. If I have some problems, then Can I send you E-mail? It was a very good time. Time is very fast. As I said, I met you when I was 12 years old. It is just 2 years. I want to see you everyday. I am happy to go to the Karma. Because there are many teachers like you. I think you are very kind. Lastly, If you want to come to Korea? Then come to Korea. Maybe there are a lot of memories. Bye bye teacher. I will pray for your uncle. Hi teacher!! It's Julie. It is really sad that I can not see you anymore. Beacause you taught me hard from when I did not know alphabet until I was in the highest class now. I learn a lot thanks to you. Such as history and how to talk with foreign well. Also you make me love English. Thank you. Actually I was young, I was scared when I saw you. That is because you were the first foreigner I saw. Please stay healthy and happy when you go to America. And do not forget me. I will not forget you, either. I want to keep communicating with you. Will you help me even if you are in America? Please contact me if you come Korea again. I want to see you until I'll become adult. Bye teacher. You are very good teacher to me. 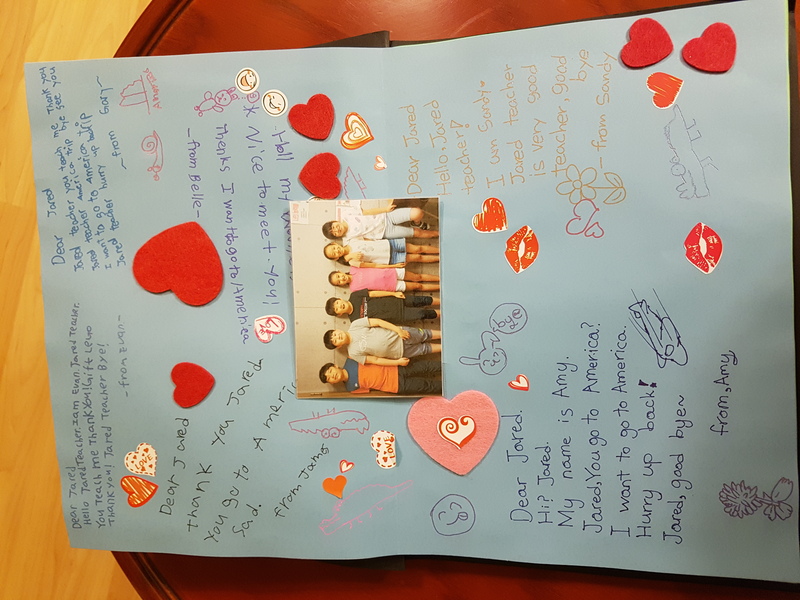 Hello Jared, I am Jun Seo. I think you will be one of the best teacher in my mind. Because of you, I learned a lot of things. I had a very good time with you and I hope that the time we were together will be the best memory in your mind. I know that you will lose many things if you go to the U.S.A. The first time you said that to us. I was very sorry to heard that. After that, I am trying not to forget you forever, because you were the first teacher who made me laugh and it was very impressived. The first time we met in the Academy, I always looked you very strangely. However, oneday I realized that you are very kind to me and my classmates, so I became a person who do not look you strangely. You know, you are the best teacher that I have seen in the Karma Academy. When you teach our class, I thought that the time we had was only 20 minutes, but it was about 45 minutes. All the time you said to us, and all the time you teach us about something, and all the time you play with us were always fun for me, and I am very sad that we have only two weeks to see each other in HS-1 class. I will miss you and other students like Julie, Toby, Andy, James, Olivia, Linda, Harry, Kevin, Junes, and so on will miss you, too. I am very sorry that I have no present for you. You gave us a lot of information and a lot of present, but I have no present for you. I am really sorry for that, because I do not even know that you will leave this country in a month, and I am busy these days, so I can not give you a present. Thank you for everything, and I hope you to see me someday. I'm sorry to hear that you will go Alaska.we will miss you so much. Thank you for teaching us until now.You are my the best teacher. I want you to come back to see us.We never don't forget you. Hello. I'm Min Jae Kim. Thank you for teaching about listening. I hope your uncle health become healthy. Also I hope I meet you again before I quit Karma. Finally I'm so glad to meet you. If you come back Karma, I will welcome you so so so much. I'll miss you so much. Teacher, We will miss you so much. I will not forget you. So please don't forget us. I'm really sad when I heard about you go Alaska. I hope that sometime we see again. I came to Karma Academy late and did not see you much. You said your uncle is very sick. When I heard that, I'm very sad. We have a short time with each other but I will miss you. Bye. i entered this academy 2 months ago. we have few classes and i"m so sad that i have to say goodbye. 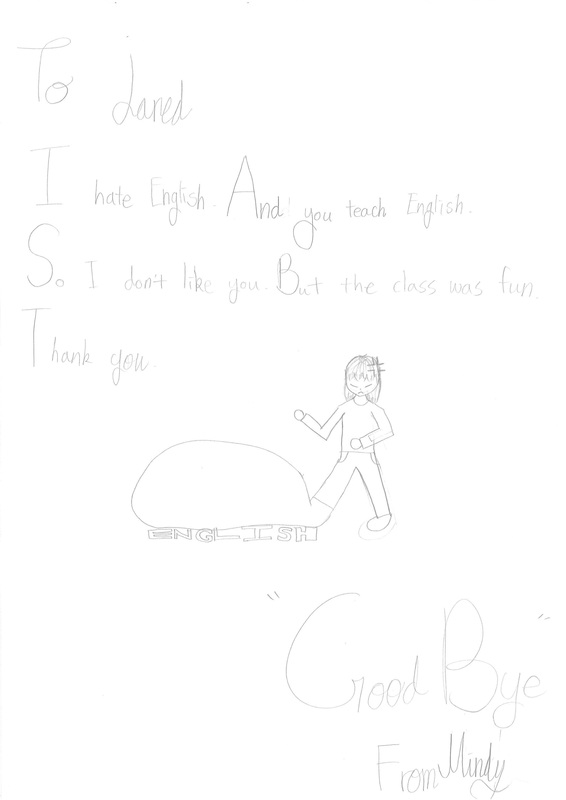 but i was very happy because i had a nice class with a nice teacher. i won't forget you if this is the last time. We had our farewell dinner last night. I felt sad and nostalgic. Standing (L to R): Curt, Grace, May, me, Helen, Phil, that new math teacher (uh oh, I'm in trouble cause I don't know his name). As mentioned before, we have this thing at Karma called "CC" class – a somewhat opaque name for what are essentially focused listening exercises using English-language pop songs. Mostly, these days, I can proudly say that my initiative to have the students prepare and present their own choices of songs has gone quite well, and 90% of the time, the students do their homework and they lead the class. I love sitting in a class where the students are leading, and even using English fairly successfully to manage the class. But sometimes a student forgets his or her homework, or some miscommunication causes there not to be a prepared song for a given class. So I have some "backup" songs prepared. One of the "CC" songs that I've been using for this is "Whatever It Takes," by the group Imagine Dragons. Like many of the CC pop songs, I was fairly neutral about the song at first, but with repeated careful listenings and presentations of the song, it's grown on me. Last Saturday, I presented the song to my HS2-T cohort, because they were returning from their month-long "naesin" hiatus and the song that the student had prepared was one it turned out we'd done before. As usual, I was deeply impressed with these students' amazing listening skills, quickly identifying missing words in the Cloze passage of the song that even I struggled to hear. So we made our way through the song. As we wrapped up the class, I told the students that I'd grown to like the song. One of the girls asked, "Why do you like it?" In fact, I couldn't think of a reason. But I always have to say something, right? That's what I'm known for, and that's my reputation: Jared always has some opinion on anything, and he'll present his reasons in little coherent, organized paragraphs, like a good debate teacher should, right? So I had to think fast on my feet. Offhandedly, I said, "Because the song has lots of long words in it." This is more or less true. It does have some unexpectedly sesquipedalian vocabulary, which the singer rattles off in rock-rap style quite amazingly. "For example," I added, spontaneously, "it has the word apostrophe. I never heard a song with the word apostrophe in it, before." This is true, as far as it goes. But then I elaborated, "'Apostrophe' is one of my favorite words." That was pure confabulation, but it supported my argument with a subjective, emotional appeal. Anyway, it satisfied the girl's request for a reason why I liked the song. But then the girls started saying, "Apostrophe, apostrophe," over and over. "Is that good entertainment for you?" one asked. Imagine Dragons, "Whatever It Takes." I have a student named N__. Because the current "test prep period" for middle schoolers (colloquially called "내신") is just now ending, a lot of students are still absent, so much to N__'s dismay, she found herself stuck with me in a class where she was the only student present. I know this is unpleasant and awkward for typical teenagers of any nationality: getting stuck in an impromptu one-on-one class with a teacher. When this happens with an advanced-level middle-schooler, I pull out my pile of randomized Type 1 and Type 2 TOEFL Speaking questions, which hinge on personal opinions and preferences, and I subject the victim to an onslaught of timed, unprepared speaking drills. N__ was quite reluctant at first, but I shortly realized that despite her being a fairly recent arrival at Karma, she'd obviously done TOEFL style speaking drills before – she was quite competent even relative to her peers who have had to suffer my insistence on this method for several years. Further, although lacking much vocabulary and having rather poor pronunciation, she had a good instinct for making instant, logical, meaningful answers. She even introduced quite a bit of humor at several points. "Argh! I hate ALL of them!" And then she said nothing more. That was sufficient, as far as she was concerned. She folded her arms to punctuate her point. What is your favorite way of getting around? (This question is meant to evoke responses on the topic of means of daily transportation, e.g. cars vs buses vs walking vs biking, etc.). "In fact, I don't much like moving at all. I would prefer to just sit at home… "
I broke out laughing, which broke her concentration, so she wasn't able to give more detail. I'm sure this pleased her. In her several months at Karma, I'd already developed an idea of her personality as one of those laconic, can't-be-bothered teenagers, and here she was showing a full self-awareness and even some humorous intentionality to this image she projected. 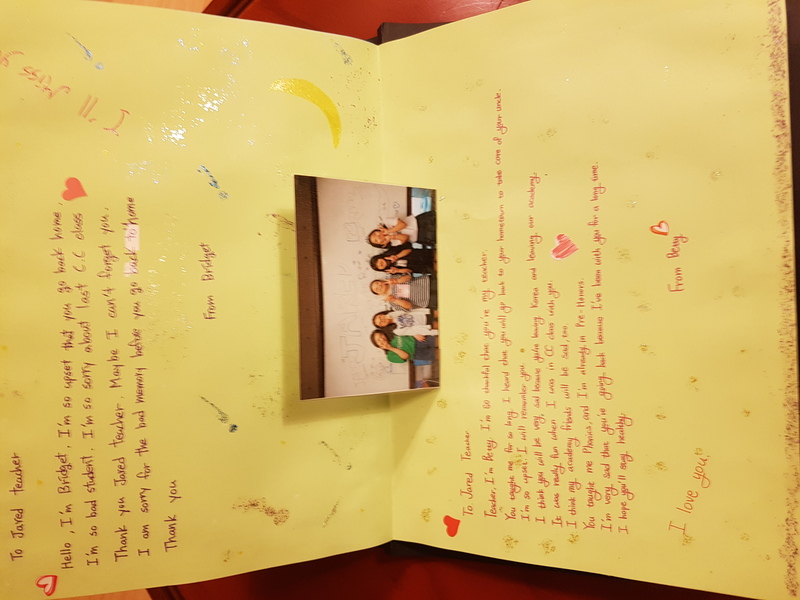 By the end of class, she was less sleepy-eyed and more comfortable – I think my positive feedback on her pragmatically appropriate answers, regardless of their official TOEFL quality, helped her feel more confident. Arnold Schoenberg, "String Quartet No. 4" performed by LaSalle Quartet. 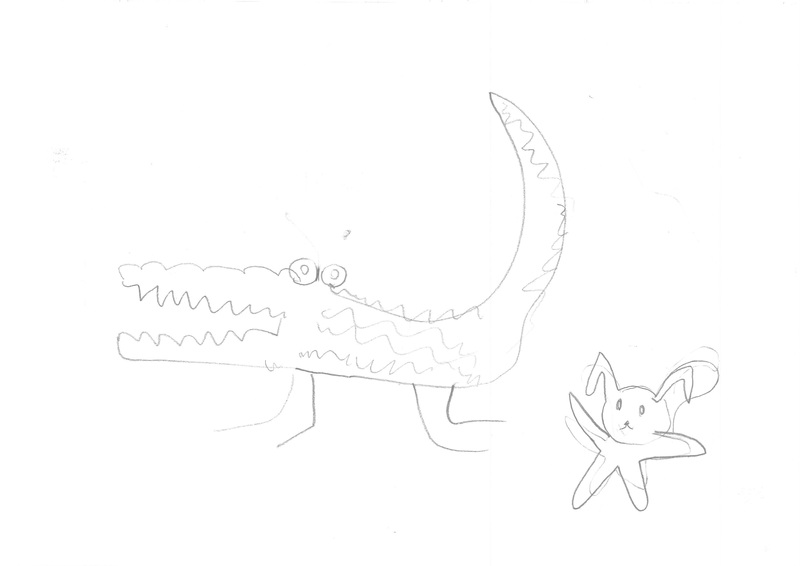 Today at work I saw a student (I’m not sure who) had added a comment to one of my whiteboard alligators. 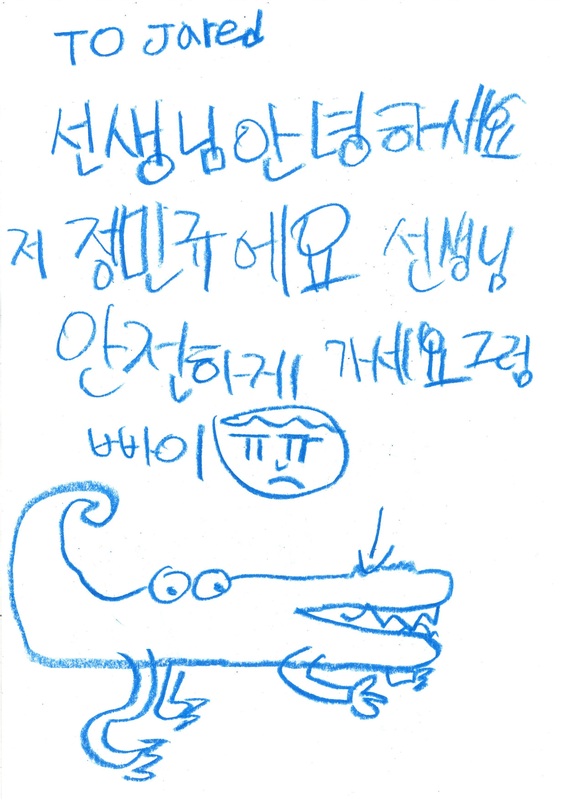 They gave the “annoyed alligator” something to say, with a speech bubble. What he was saying was, “스무th” [seumu-th] which is a transliteration of “smooth”, I suppose. I think there’s some kind of meme going around Korean tweenagerdom using this English word. But what I found surprising was that the transcription into the Korean alphabet (hangul) shows a certain phonological sophistication, in that the “th” sound is un-transcribed, which in turn indicates an awareness that the “th” sound doesn’t exist Korean. Normally, the “th” sound is alternately transcribed as either “ㅅ/ㅆ” [s/ss] or as “ㄷ/ㄸ” [d/tt]. And most Koreans seem singularly unaware that in fact it is not either of these sounds but rather something else. So this unusual non-transcription event makes me feel happy that at least one junior whiteboard vandal at Karma has got the concept. Here’s a picture. 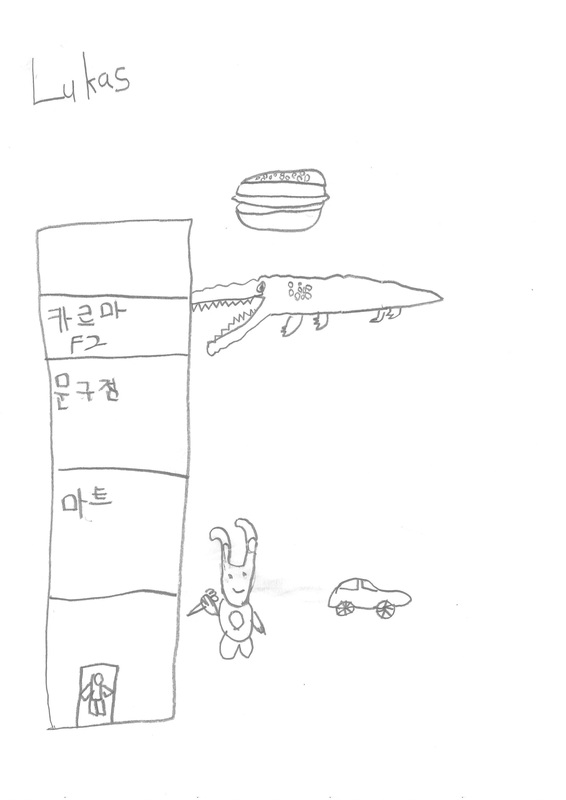 My sixth-grade student Seoeun raised her hand, yesterday, as if she had an urgent announcement. "Today is today," she said gravely, and without hesitation. It was clearly something she'd planned out in her head, as one does when working in a foreign language. "Um, yes," I agreed. "Why are you telling me?" "그냥" [geunyang = just because], she offered, shrugging. "OK, good to know," I said. And we moved on. Well, the details are not nailed down at all, but I've made it "official" – as much as such things can be in Korea. 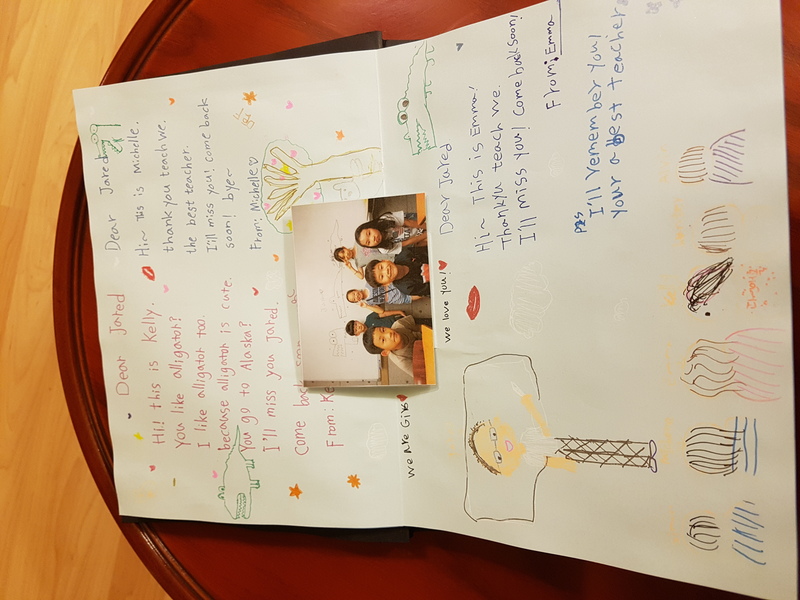 I am ending my career as a Korean hagwon teacher and moving back to the US within the next 2 months. Exact dates will be determined eventually. This is really hard for me, and I hate feeling like I am letting down the people (coworkers and students) at Karma, where I have been working these past 7 years. But it feels necessary. I met with my friend Peter this morning, and we talked for a while and had lunch before I went to work. He's back in Korea having just finished his Master's in Korean Studies at Johns Hopkins SAIS (which is in DC). Very impressive accomplishment, in my opinion. And now he's networking and thinking about his next move – some kind of job, obviously, but he seems willing to take his time and find the right gig. His quizzing me on the whys and wherefores of my big decision were helpful. He has a way of getting me to think clearly about my intentions and motives. We were doing short-speech responses to speaking questions. The question was, "Do you like your family, or not? What are the best and worst parts of your family?" 6th grader Jaehyeon, incorporating a very long pause as he groped for a possible answer, said, "The best part of my family is… me!" "I see," I said, mildly amused. "So, what's the worst part of your family, then?" I prompted. "The worst part is… not me. The other ones." At that, I laughed. At least he was being consistent. Imagine Dragons, "Believer." This was a song recently chosen by one of my students for a CC class. It's grown on me, as tends to happen when I teach a song to several classes over as many days. I like how it's structured like a good debate speech: "First things first… second things second," etc. I pointed this out to the students and they just groaned. Today is the big show. It'll be a long day, but the end is in sight. The results will be what they are, and there's not much left to be done except just do the show. Last night my student Gary, a third grader in one of the lower level classes, was putting in extra time preparing his role. 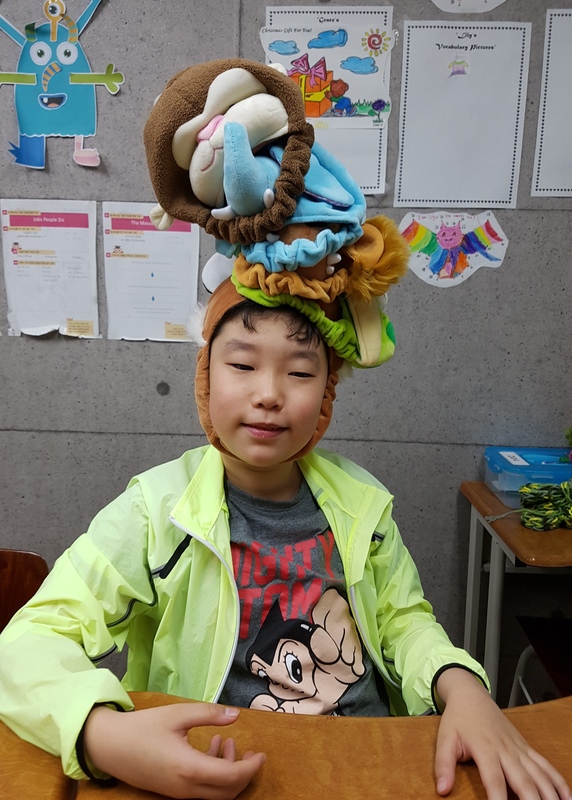 He's kind of the main character for the particular little play that we're doing in that group, and as all the teachers have complained to me, the play is a bit difficult for their level. So he has a lot of English to memorize, and it's quite a bit beyond his level. In my defense, the students did choose the skit themselves, after having read through it and several easier choices several times. So they had some idea what they were getting into. Gary was feeling pleased with himself because he'd managed to get it pretty well mastered. So he took ALL the animal hats that we are using as costumes for the skit and put them ALL on his head. I asked him if that meant he intended to memorize all the other roles, too. He quickly removed the hats, but not before I took a picture. 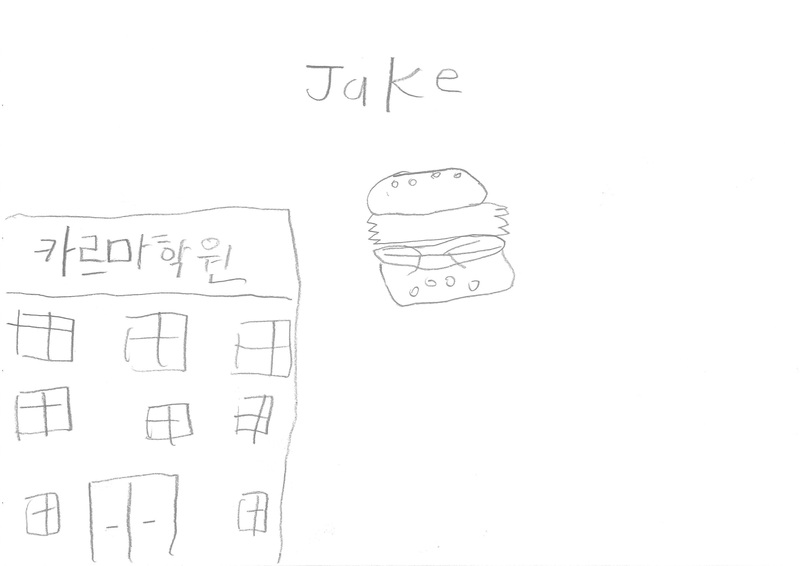 Sometimes my middle school students talk to me in Korean, even though they’re perfectly capable of expressing themselves in English. Partly, this is to indicate a different pragmatics: it shifts control of the discourse from me to them, since I’m the one with limited Korean ability. I think they derive some satisfaction from that. So, especially during times of just chatting or joking around, they’ll start talking in Korean, but still talking to me. This is remarkable, because half the time I don’t understand them, but I fake it pretty well, and I guess they enjoy the notion that they’re “teaching” me, too. 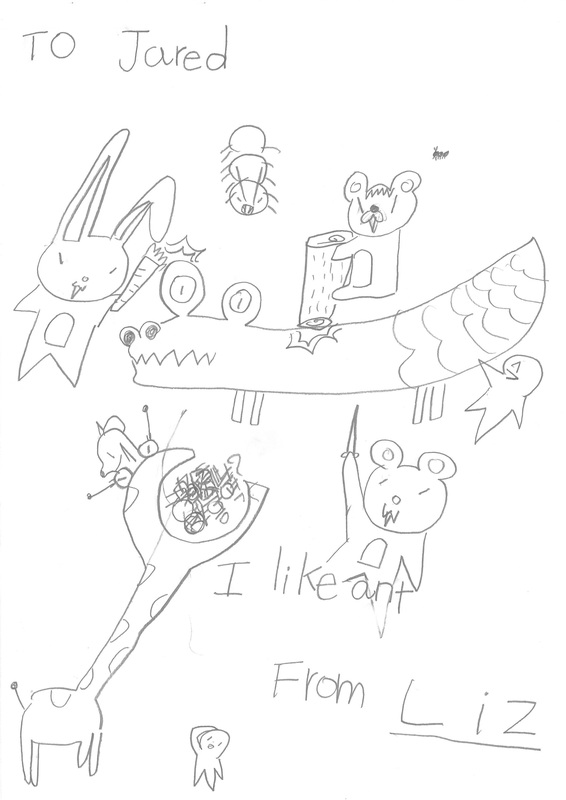 One girl, Gayeong, said, painting a serious face for just a very short time, “But, Teacher! I have 웃음조절장애!”. I laughed pretty hard. “웃음조절장애” means, roughly, “Laughter control disability” – with the same formal or vaguely medicalized discourse level. It’s the way a Korean child psychologist might talk about it, if it were considered an actual disability. So it was a joke. I’ll have to remember the experession. In principle, I really enjoy the annual talent show concept we do with the elementary-age kids at Karma English Academy. It takes me back to my own elementary years, at the "hippie" Centering School in Arcata, where for each hour we spent doing math or reading, we spent 5 hours doing drama, art projects, and other "touchy-feely" stuff that was built on creativity and kid autonomy. My strongly held notions of the best pedagogical methods with children are substantially derived from this experience. But in practice, there are issues. One is the somewhat poor planning that is inevitable in such undertakings in the Korean context, in my experience. Though actually, that doesn't bother me so much, though it can create some stress. What creates the most stress, though, is differing philosophies vis-a-vis the purpose and goals of the project. In my mind, the main purpose is to give the kids autonomy to create (and/or fail to create) their own expressions using English. 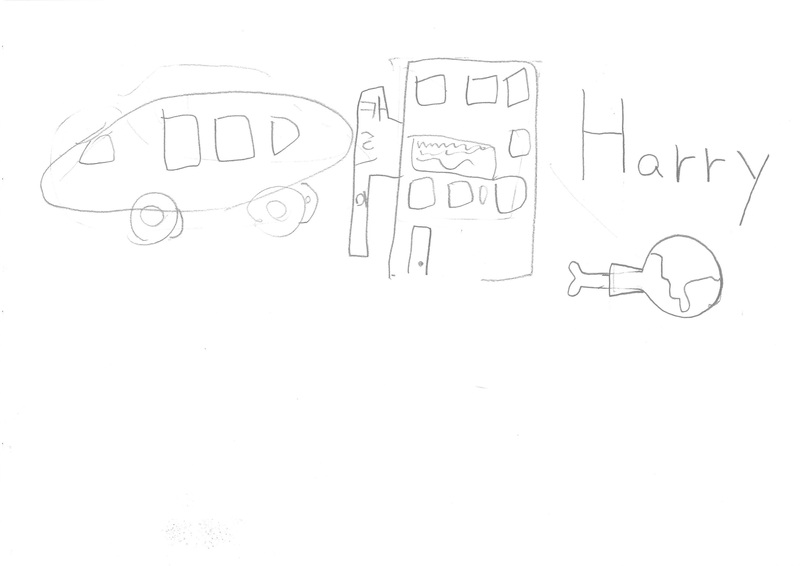 I will grant a secondary purpose that it serves to provide some positive "marketing" or publicity for the hagwon. But I don't believe it should be some kind of slick, professionalized production. But most of my colleagues are incapable of granting kids autonomy, and so letting them fall down on their own is unacceptable. If the kids can't do it, you do it for them. This is built in to the Korean educator's mindset, I suppose. It's partly why kids spend so much time sitting in class, learning so very little. But it has definitely led to some unpleasant conflicts on this year's go-round. I hate to see teachers doing things for the kids. Help them, sure… nothing wrong with that. Show them how, sure. But don't take over the kids' projects because the work the kids have done doesn't meet some ideal standard. 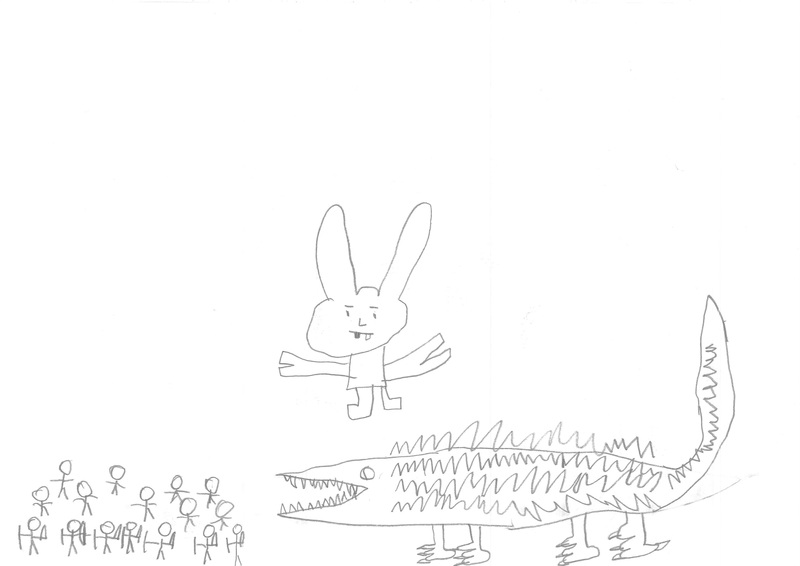 One younger, lower-level class is doing a little play entitled "The Frog's Tail Tale" – a script I found and adapted from somewhere online, based on a traditional West African folk story about how the frog was too proud of his tail and angered the gods, so he had it taken away. So the kids need costumes, and all the animals' tails play an important part in the story, so that is the focus of our costuming. 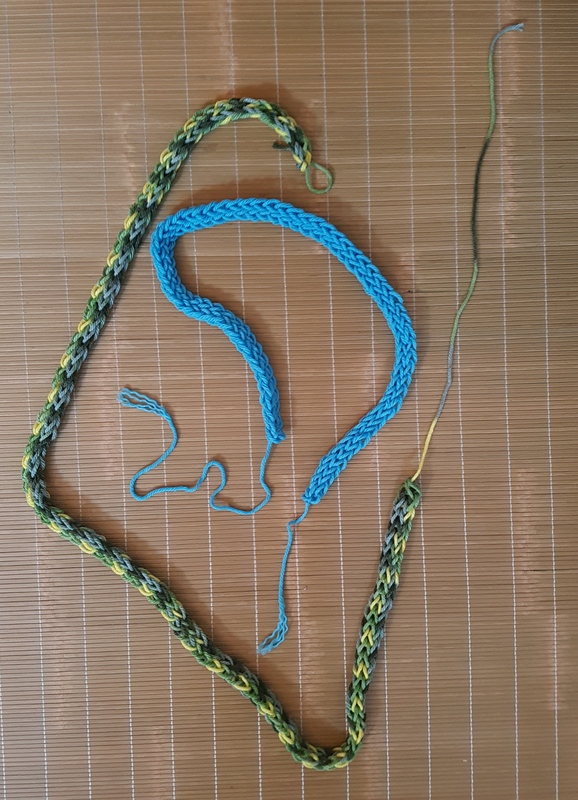 Grace suggested we do "finger knitting" to make the tails, and it seemed like a fun, creative idea. 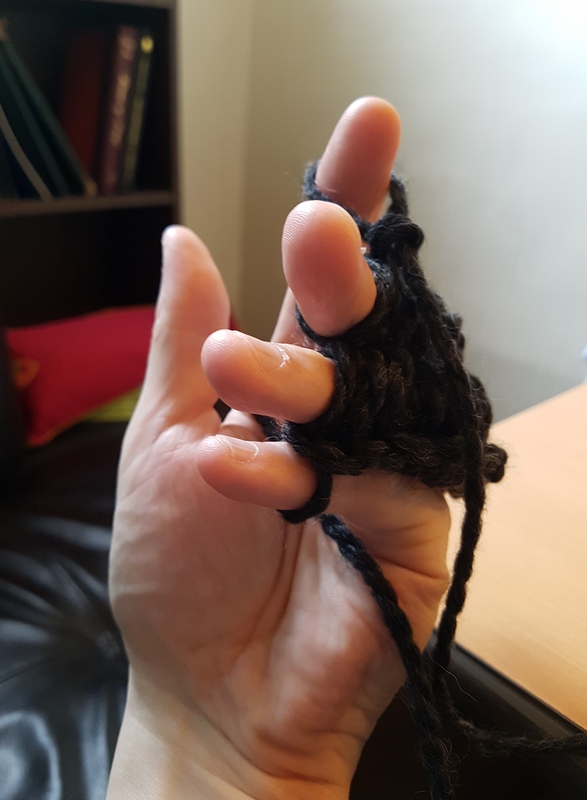 I got some yarn, I taught myself the basics of the skill well enough to be able to teach the kids, and then we spent a few classes learning finger knitting, and making tails for our animal characters. 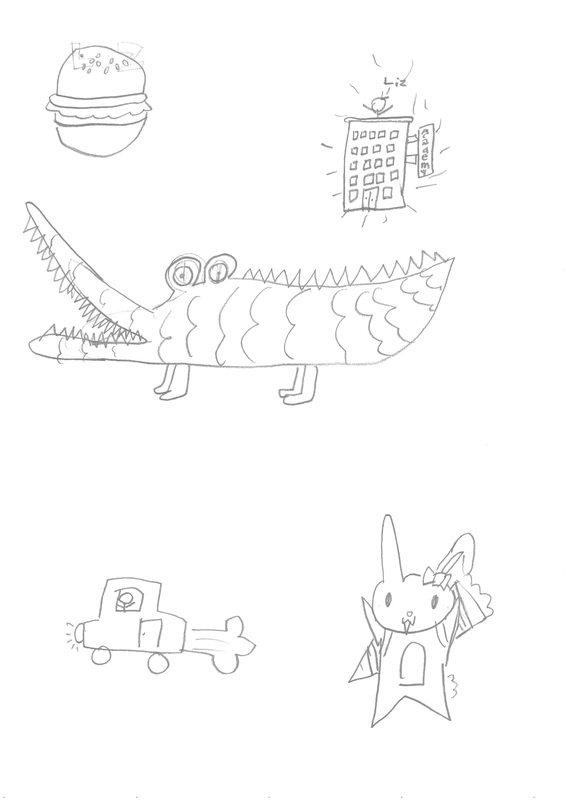 Of course, the kids' output was fairly low quality. One of the other teachers said, "Oh, you'd better do it for them, then, so it looks good." I started to argue about it, but such conversations devolve quickly into a kind of debate where we talk past one another because our foundational notions of child pedagogy are incompatible. We don't even share definitions. Previous years have taught me this. And I'm tired of arguing about what are fundamentally cultural issues like that. I live in Korea, now. I feel the onus is on me to just go with the flow. And I sit at home, these last few days, finger-knitting animal tails for our play. I could see myself adopting this as a hobby as an old man, to pass the time sitting in a rocking chair somewhere. 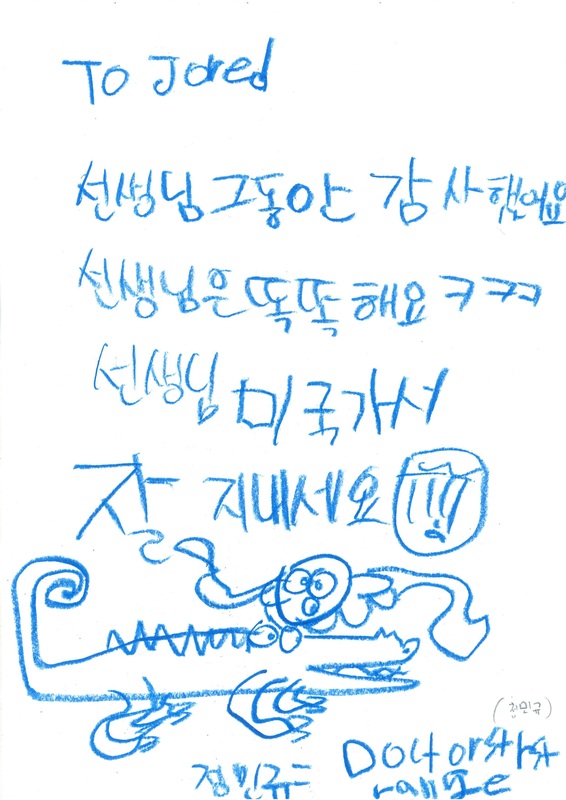 My 9th grade student Seunghyeon draws excellent doodles on his TEPS Test listening practice answer papers. He's no slouch at getting the right answers, either, and has a phenomenal passive vocabulary in English, certainly better than your average American native speaker, I would estimate. He doesn't talk much, though. 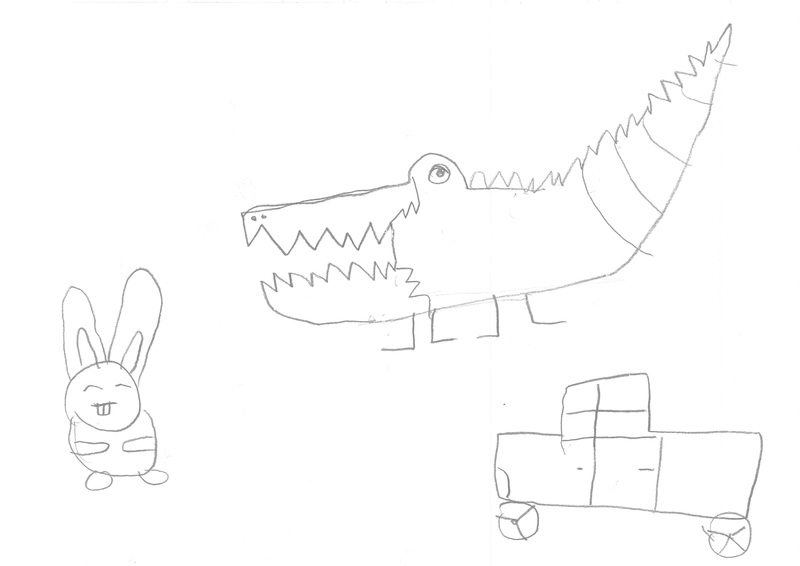 Anyway, he paid a tribute to my alligator characters on the top of his most recent answer paper, the other day. Even starting with having Monday off, this week is a brutal schedule. One of my coworkers is absent, so I'm covering some substitute classes on top of an already fuller-than-usual schedule. So nothing much to say, here, now. I have 7 classes today, back-to-back, no breaks. I guess I'll go early and prep. The Karma Talent Show is coming up. A group of elementary students selected this song to sing in the show – I made them choose the song, so that when they complained about it later, I could point back at them and say, "hey, it was your choice." That was a useful decision, which I fall back on almost daily. I'm trying to get them to practice it. My own musical skills are limited, so it's a bit like the blind leading the blind. But I guess it's going okay. Chris Brown and Justin Bieber, "Next To You." Don't pay attention to the video – I'm not sure it's relevant to the song. I have a new student, a 5th grader who has adopted the nickname Mario. He came into my class clearly not wanting to be there. Straight up refusing to answer, and refusing to participate. Shortly, however, it became clear he actually knows English pretty well. He may have the best vocabulary of anyone in the class. So now, several months on, he still doesn't do homework. But he participates well, and sometimes even seems to be having fun, before remembering he hates being there and puts his scowl back on. We did an in-class assignment I created, that I've used a few times, to go with a chapter in our textbook about "Why do you want to travel there?" which covers different countries. The assignment is to make your own country, then explain why you want to travel there. 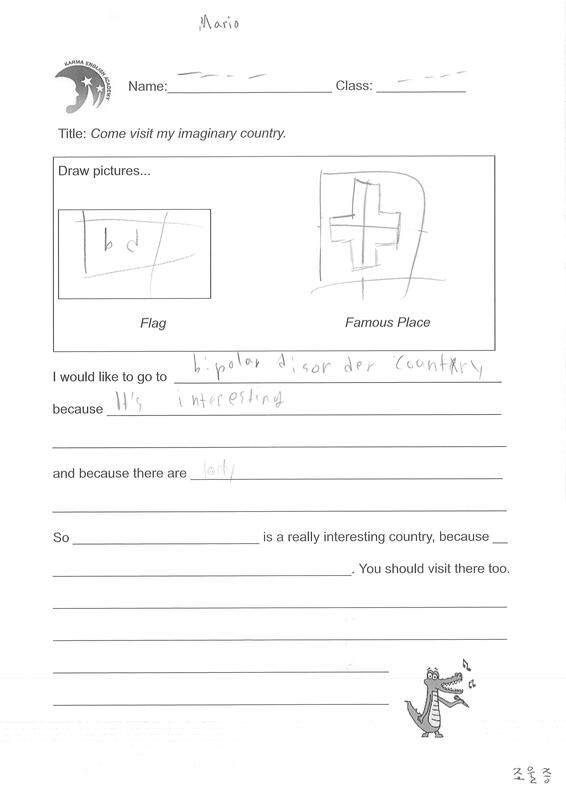 Many elementary kids like making their own countries, though most do so in a humorous or cartoonish vein. 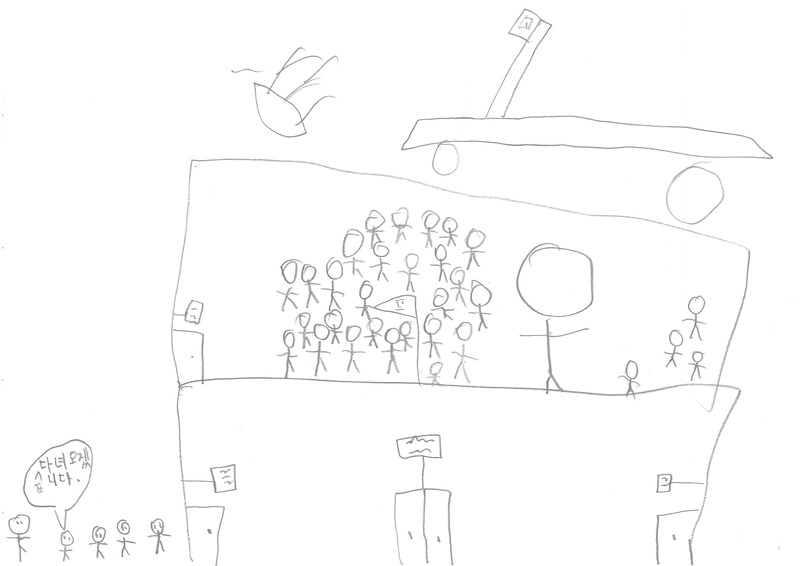 Mario submitted the below. It was, of course, pretty limited in terms of the requirements of the assignment. And desultory, in terms of effort. But where did he learn the term "bipolar disorder"? What to make of the very interesting (in very faint pencil) "… and there are lonly "? It's my own note, at the bottom corner, where I wrote the Korean term for "bipolar disorder" from the dictionary (조울증). 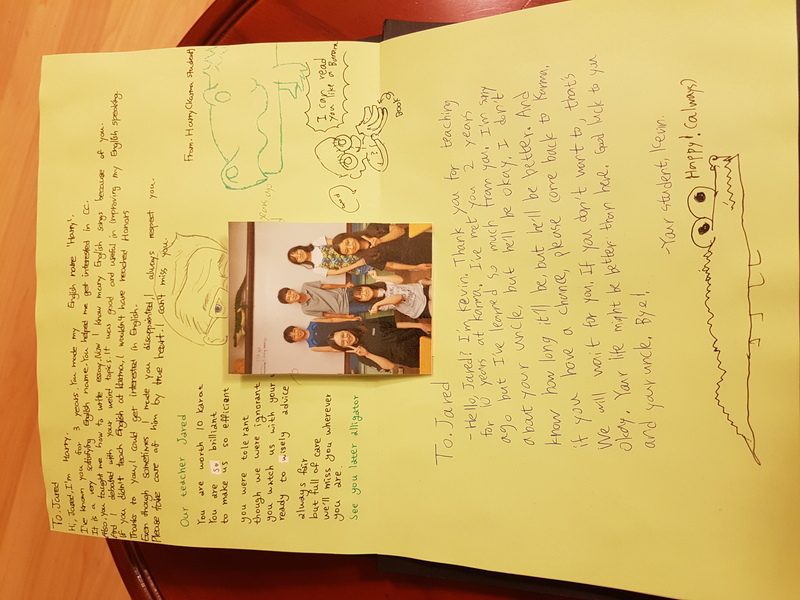 That's because I wanted to discuss the content of the paper with Mario's home teacher, and I wanted to be prepared with what "bipolar disorder" meant – it's not exactly a common concept for English-speaking Koreans. And who knows where Mario found it. The dictionary? His parents? How could he even have known the Korean word for it – Curt observed that it's not exactly a regular word in Korean, either, but rather a medical term. 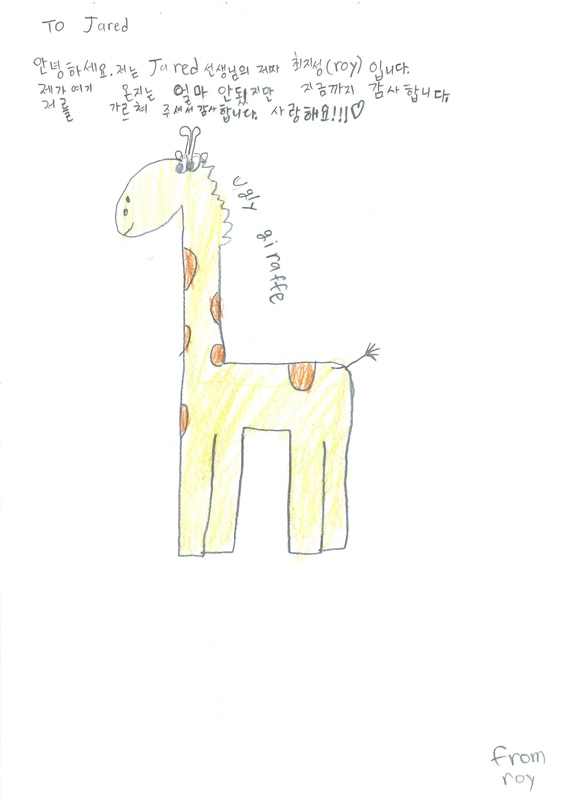 How does a fifth grader wield such a term, it two languages no less? This boy also has offhandedly said he wants to attend Julliard (in New York) and has vandalized one of my toy frogs. Something's going on. This exchange actually happened in a 7th grade advanced class. Julie: So I don't like YOU. Tobias: That doesn't make sense. James (glaring at Tobias): Hey! I found this incredibly funny, not to mention indicative a lot of cleverness on the parts of James and Tobias. Yet when I tried to explain it to my coworkers, we got bogged down in trying to parse the premises and implications of the statements. It felt like a kind of logic class for standup comedians, where the students were not all native to the same language. So, here's my question for logic students: Why is Tobias's statement a potential insult toward James? I gave up, in the end, in explaining it to my coworkers. 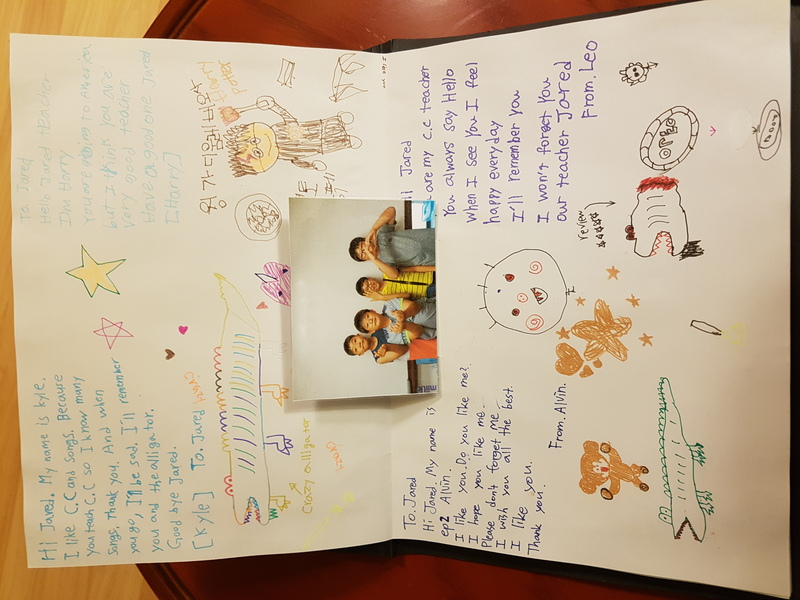 But I had laughed hard during the class, and the boys were clearly intentional enough in their humor that they were pleased with the appreciation I showed them. 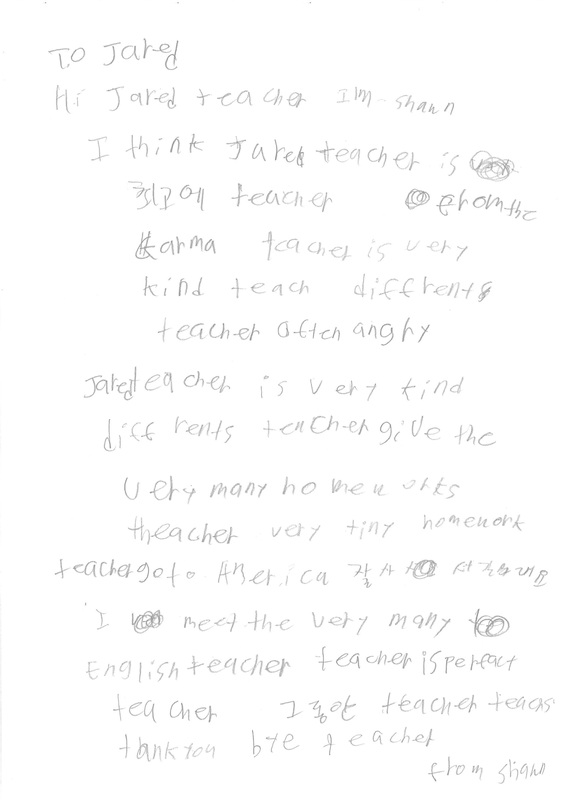 My 5th grade student John recently started at Karma. 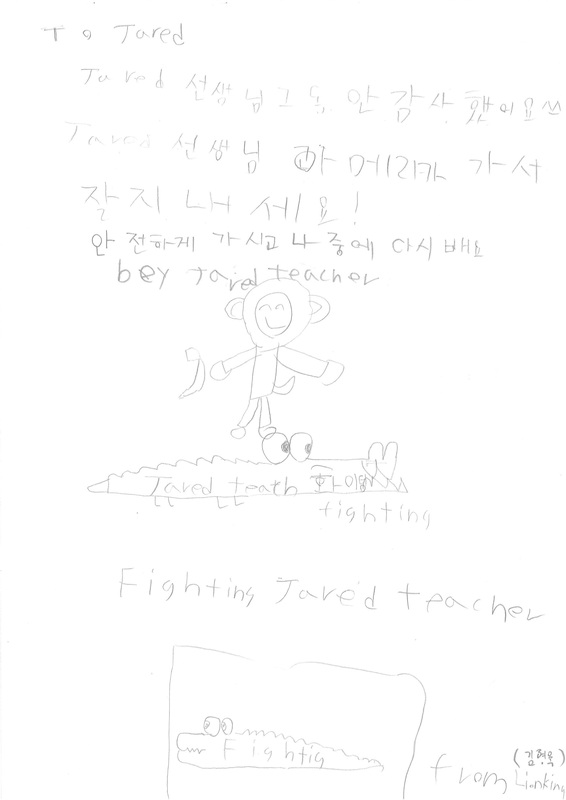 He has never studied English before, so in the context of Korean English education, he's a rather "late starter." It's hard to place him at a place like Karma, because classes at his grade level don't really have "beginner status". 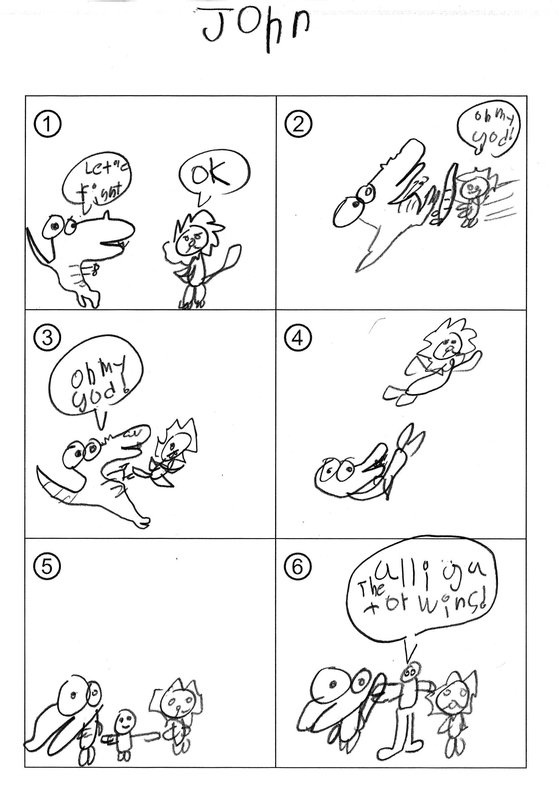 Still, I was very proud when he produced the following comic during an exercise in class. He carefully asked (in Korean) how to say each thing in English, and I wrote the translations on the board. 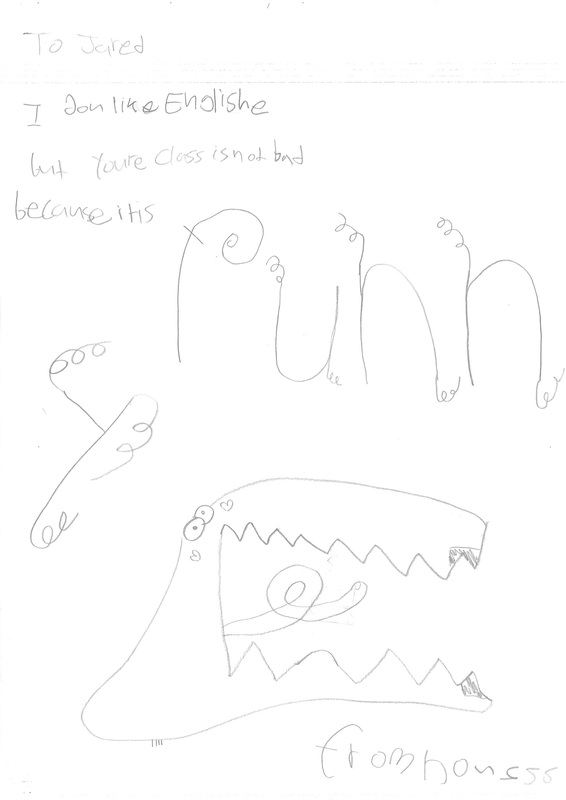 Then he copied the letters (he hasn't even mastered the alphabet) into his comic. 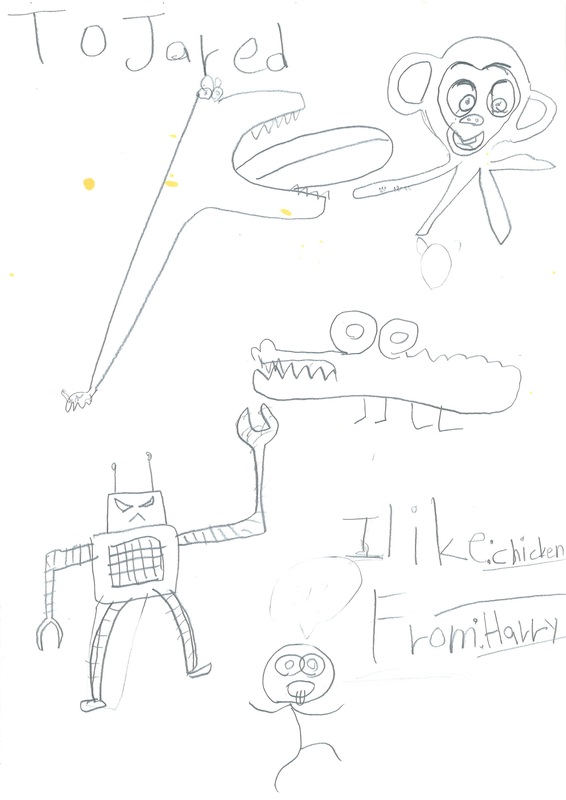 I thought his characters (an imitation of my alligator character, along with some lion character he created), while quite rudimentary, were cute, too. 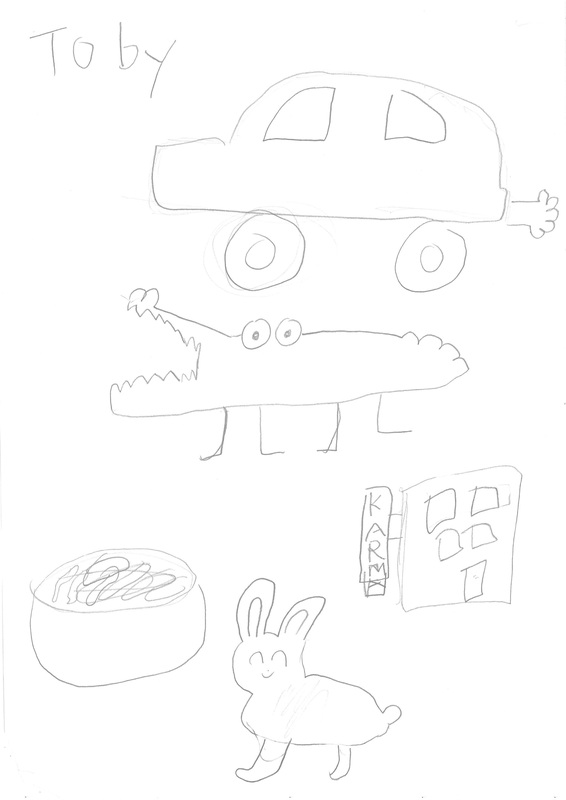 He might have some artistic talent, anyway.